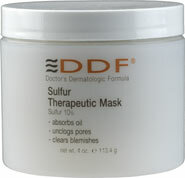 Sulfur Therapeutic Mask, - This medicated mask is for the treatment of acne. The anti-inflammatory properties of sulfur combined with aloe vera, purified clays and aromatic extracts is useful in the management of oily skin and clogged pores. It reduces the severity of acne blemishes and allows the skin to heal.